Is there anything peskier than a cold that just. won't. go. away? At times like these, naturally minded folk like you and me reach for essential oils. Yet we may wonder, which ones are best? Which ones are safe for babies and children? Should any be diluted first, and by how much? 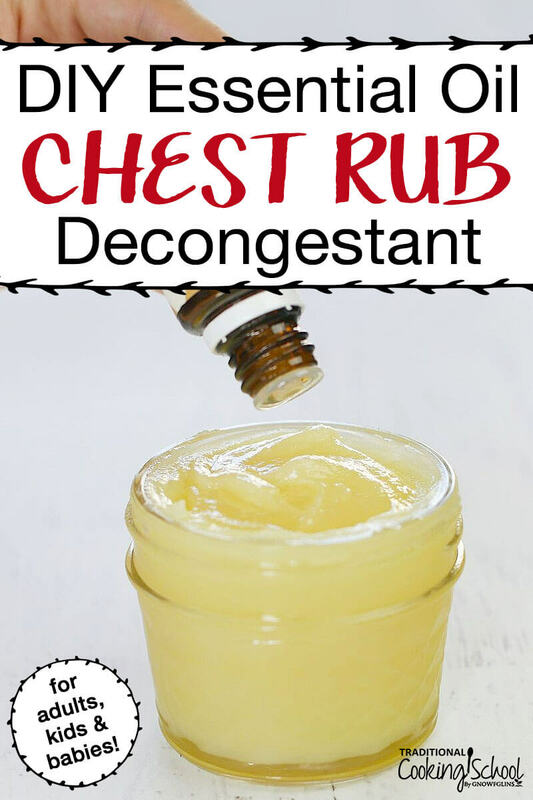 This homemade essential oil chest rub answers every one of those questions! You choose the RIGHT essential oils with the right dilution rates depending on the ages and needs of your family members. Whether you have a 3-month-old or a 12-year-old or a 21-year-old in your household… this salve works as a natural essential oil decongestant! Below I've compiled a list of seven essential oils. Mix and match depending on your age and needs. The key to safely using essential oils is dilution. 15 drops of essential oils per 10 mL bottle of carrier oil. 3 drops of essential oils per 10 mL bottle of carrier oil. 1 drop of essential oils per 10 mL bottle of carrier oil. To find a dilution rate that works for you, check out this helpful chart. The Complete Book of Essential Oils and Aromatherapy, 25th anniversary edition, also contains a dilution chart starting on page 14. So does The Healing Power of Essential Oils on page 53. Which Oils Are Safe For Pregnancy & Lactation? If an essential oil is safe for general use at any other time of life, it's probably safe during pregnancy — IF properly diluted. As for breastfeeding, follow the dilution rates above and remember not to use eucalyptus, peppermint, or rosemary if you're going to be in close proximity with your baby anytime soon. Check out our Women's Health eCourse, lessons 14 and 17, for more info. 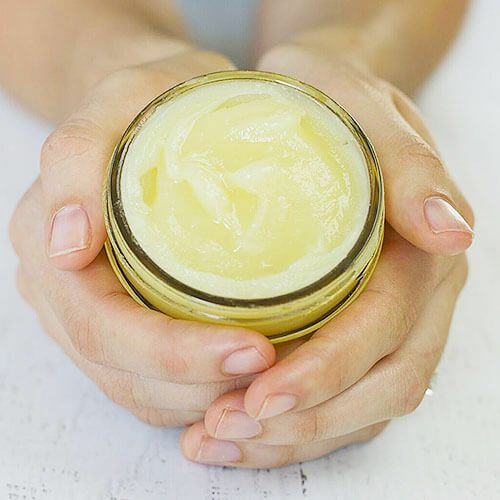 As cough and sore throat season approaches, stock your medicine cabinet with the RIGHT natural remedy for the job: this DIY essential oil chest rub! It's an herbal salve or balm that clears up coughs, nasal mucus, and sinus gunk in a flash with healing ingredients. Plus, I've made it easy to mix and match the essential oils so your homemade decongestant can be safe for kids or babies, too. In a double boiler over medium heat, melt olive oil and beeswax together. Stir the mixture every so often until melted. When fully melted, put a few drops of the mixture onto a piece of wax paper to check the consistency. Once you're happy with the consistency, remove oil and beeswax mixture from heat. Immediately pour into 4 ounce Mason jar. Apply to chest and/or neck area during a cold to help with coughs and respiratory congestion, especially before bed to aid sleep. I've loved the smell of tea tree ever since I was a little girl! When my siblings and I got sick, mom would pull out a little jar of salve. She'd dab a small amount under our nose and rub some on our upper chests before bedtime to help clear our airways and let us sleep. I don't remember what was in it except that that was my first introduction to tea tree. So every time I came down with a cold after that, I would ask mom for more of the “nice-smelling salve”. It always helped with lingering congestion! I've since learned that some people don't care for the smell of tea tree. 😉 Oh well. That jar of salve — who knows what happened to it! — inspired this recipe. Now adults, kids, and babies alike can sleep more peacefully during colds. Not to mention, get healthy faster! How do you get rid of colds fast? Will you try this essential oil chest rub? Thanks for all the info on oil dilutions! I had 4 of my 7 children at home; it was 100% better than my hospital experiences! Now I have 2 grandchildren with a daughter who doesn’t care nearly as much about nutrition as I do. Since her kids are going to be sick more often as a result, these essential oils will come in handy! Nasal rinses, Vit C, chiropractor, hydrogen peroxide in ears, and bone broth is what gets us better fast. I have Roman Chamomile. Can I use that instead of the German Chamomile? Thanks! At what age does the category of baby end and child begin? Hi Kirsten! That’s a great question. 🙂 I’m considering “babies” to be anyone under the age of 2, and “children” to be older than that. I’ve corrected the post to be a little more clear. 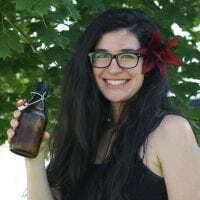 Thrilled to get the essential oil salve recipe! I do already use the essential oils and they are amazing – but we do have issues that I can’t help but know this recipe will have to help! Wonderful, Dee! I hope you love it as much as we do! I’m confused… You mention 30 drops of EO’s per ounce of carrier oil then your recipe includes 150 drops in only 4 ounces of oil. Are you considering the beeswax to be another ounce so it makes your total 150 drops? Love your blog! I cough up yellow clobs on mucus (not sure right term) some mornings or in shower. It’s been happening long enough I know it’s an issue, not sure how to fix. I have normal to bad allergies depends on weather, environment & farmers crops at harvest. I’m not sick with a cold. Doctors say I sound clear. After reading this recipe for chest decongestant thinking it might help. Would you recommend a certain EO for this. I don’t have cough at all. It’s just when wake up & the sinuses are clearing out.